I’ve decided I’m going to blog about my business trips. Not the “business” part, but the other parts that happen when I’m not working. This blog is mostly assembled for my kids …like a bloggy post-card. But if you like it, hey, more power to ya. After about only 2-hours in Milwaukee I quickly came to the conclusion that, if I had to pick a new place to live (maybe because I turned states evidence against a mob boss and had to relocate my family with the help of the FBI), I’d pick Milwaukee …or some place in Wisconsin. It’s beautiful. It seemed lacking in humidity. There was cheese. 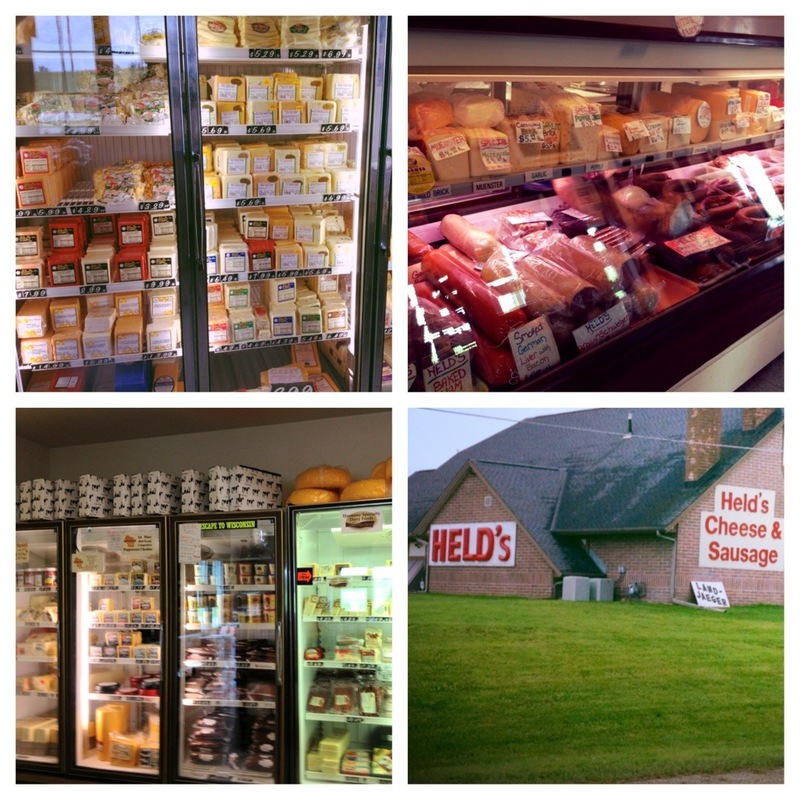 Cheese stands and billboards for cheese and a complete and total statewide pride in cheese. I thought this was the stuff of legend and myth, like, “Seattle is known for coffee,” or, “make sure to get some authentic BBQ in Kansas City,” …and I’m sure those myths are true. But the cheese thing in Wisconsin? It’s everywhere and …it’s …awesome. I forgot a belt for my trip. Getting to Wisconsin means having to go through Chicago, and that was torture. I spent 3 hours each way in Chicago traffic. Next time, I’m taking the ferry. 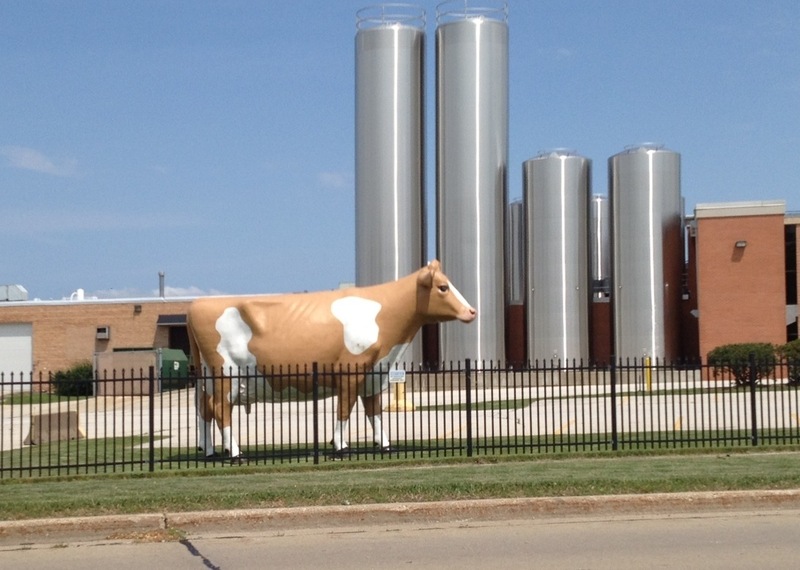 I saw a giant cow statue. 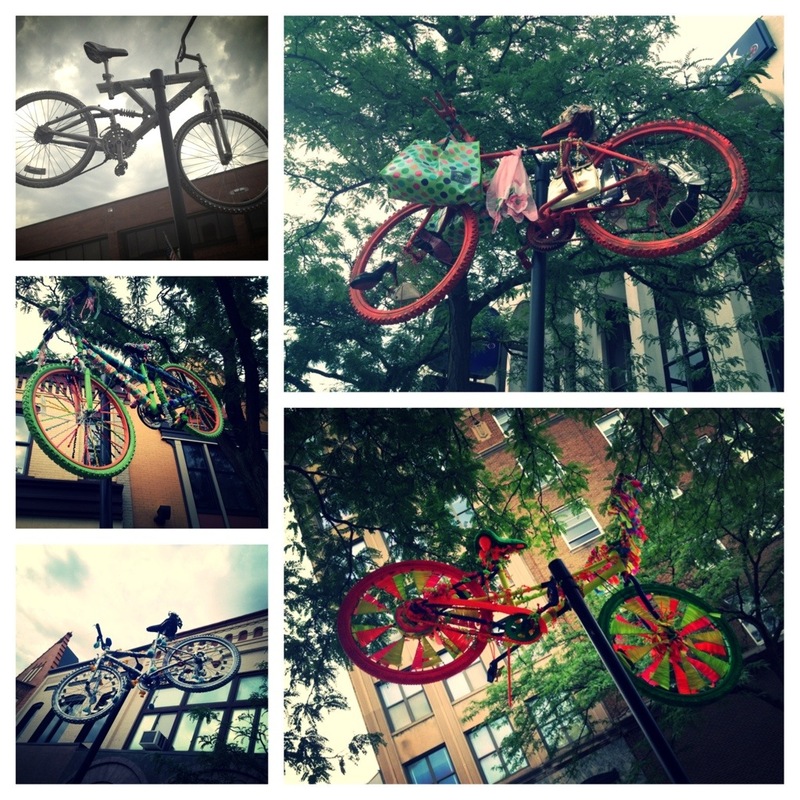 In the quaint town of Fond du Lac, there were bikes hanging from trees. 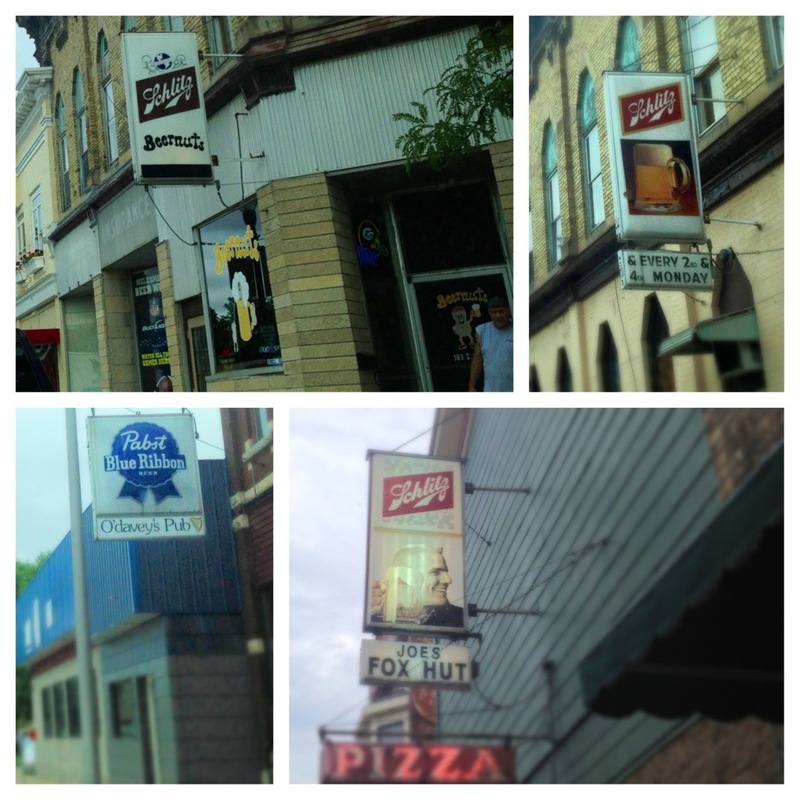 Maybe I don’t notice it in Michigan, or in the other states I’ve visited, but at some point in history it was a big deal for a beer brand to claim a bar as a “Schlitz bar” or a “Pabst bar” …and times have changed and the windows are littered with your typical Budweiser and Miller neon signs and specials, I was fascinated by the old timey beer signs that still hung outside of dozens of pubs I passed. Before I left for my trip, my 6-year-old said, “oh, boy, Daddy …Wisconsin! Bring me back some cheese.” I don’t know how she knew about this, but she knew even more than I gave her credit for. In Wisconsin, see, it’s not just a well-aged joke (ha! a cheese pun), but they truly love and celebrate their rich history of cheese. Every highway exit seemed to feature another cheese outlet, and this particular one I stopped at boasted over 150 varieties. It wasn’t an exaggeration. I opted for some beef jerky (because cheese doesn’t travel or ship too well), and some rice popcorn. Another thing I try and do whenst traveling is visit local eateries. A man can only eat at Applebee’s, Chili’s, and Outback Steakhouse so many times before he snaps. And I’m not saying those places are all bad …if I grow tired of variety and the unknown and just need something familiar, the appeal of those places is their familiarity. 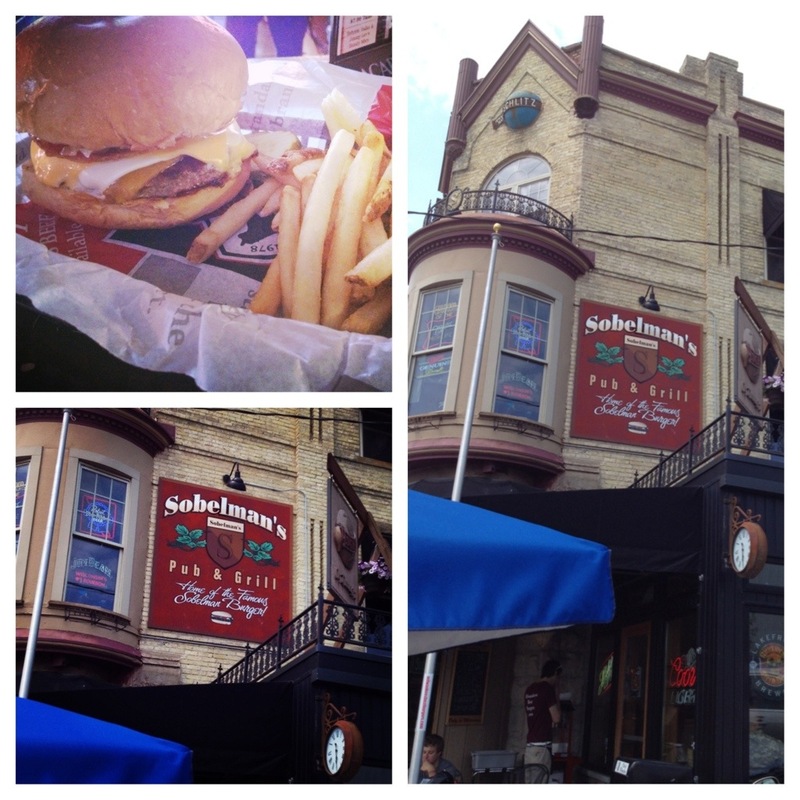 However, in Milwaukee a friend of mine said I must eat at Sobelman’s, and their signature burger featured three kinds of cheese and jalapenos. It was incredible. Not to mention, the bartender and the waitress who chatted me up were ridiculously friendly. The friendliness of Wisconsin will be a topic for another blog post. In the end, it was a great week. More to report tomorrow. ← Things I Wonder: Are 15-Minute Bursts Working? Scott… I regret my scheduled didn’t allow me to take the ferry. I also want to delete this entire post because I didn’t make a single reference to Laverne & Shirley …and because “trip to Wisconsin” was already blogged about, by you, in 2005. I feel like a fraud, now.